WEST SPRINGFIELD, Mass. 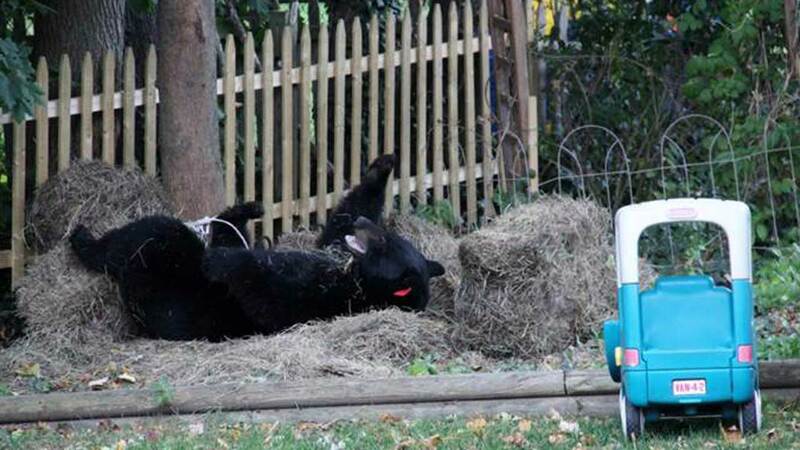 -- A black bear had a ball in Kimberly Burke's backyard. Literally. He popped her grandson's ball, rolled around in the hay and took a dip in the pool. The bear spent 20 to 30 minutes frolicking outside her home in West Springfield, Mass., Burke said. Burke recorded the bear's playtime and posted the video to Facebook. In the video, she calls him Spartan Bear because he enjoyed the hay bales, where her grandson practices throwing spears, so much. "Literally untied the hay stacks from the tree using his teeth," she said. The bear seemed to enjoy himself. "I think he smiled a few times!" Burke said.